The ultimate Italian lager since 1859, Birra Moretti's special blend of high quality hops creates a smooth, full bodied beer with wholemeal bread top notes which are cut by a delicate citrus note. 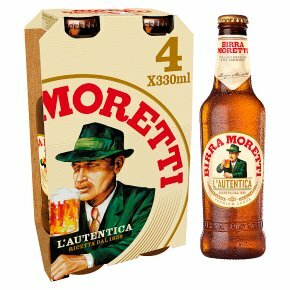 Birra Moretti is still brewed to the authentic recipe that was created by Luigi Moretti in 1859 in his beer and ice factory in Udine, north east Italy. The ultimate Italian lager since 1859, Birra Moretti's special blend of high quality hops creates a smooth, full bodied beer with wholemeal bread top notes which are cut by a delicate citrus note. ABV: 4.6% AROMA: Freshly baked croissant, fresh yeast with hint of candied peel. FLAVOUR: Toasted wholemeal top notes with a citrus hop base. MOUTHFEEL: Smooth, medium bodied and slightly sweet. FINISH: Clean cereal finish with a hint of citrus. FOOD MATCH: Pizza fresh from the pizza oven!